Deciding between an ice pack and a heating pad for an injury can be confusing. Devin RH Smith, MD, UnityPoint Health, breaks down what you need to know about heat and cold therapy in order to help relieve your aches and pains. 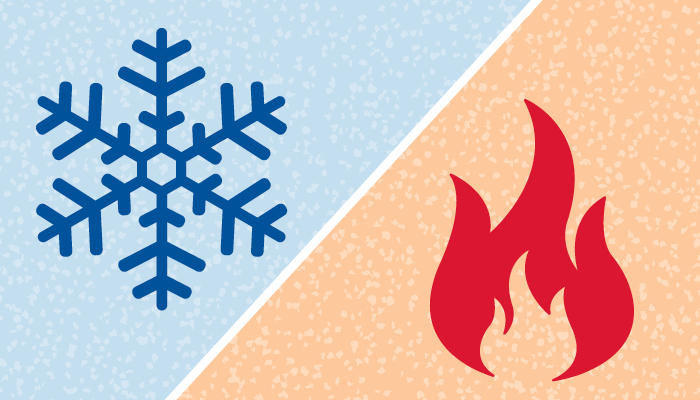 While it’s safe for most people to use heat and cold therapy, there are some who have conditions making these options unsafe. Dr. Smith says it’s also not recommended to use heat therapies over implanted devices, like knees or hip prostheses. He says the underlying materials may actually absorb and redirect the heat in unusual ways. Ice immediately. 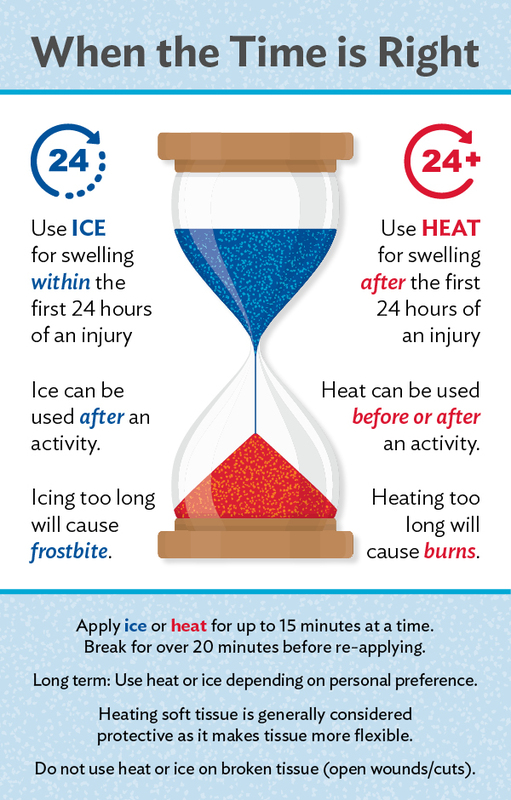 Use ice for inflammation within the first 24 hours. Ice is best as soon after the injury as possible, but never during the activity. Personal preference. After 24 hours, using heat or cold therapy can be determined according to your preference. Avoid open wounds. Using ice over deep cuts is dangerous because skin is much more vulnerable to freeze-injury without the top layers of skin acting as a protective barrier. Use a protective barrier. Keep a thin layer of cloth, like a T-shirt, between the ice and skin. This reduces the chance of frostbite to the skin while using ice for swelling. Stick with small particles. The smaller the piece of ice being used for ice therapy, the better. Try crushed ice or even bags of frozen vegetables. The smaller pieces conform to the injury size better; however, it works just the same as bigger, frozen pieces. If pain and swelling don’t improve after one week, it’s best to see your physician. Dr. Smith says other clues it’s time to make an appointment include any injury that causes instability, inability to bear weight or loss in a joint’s range of motion. “Any injury that punctures the skin and becomes painful a couple days after an incident, or appears redder, raised, hot or causes red tracks streaking away from the wound should be examined by a physician, as it may represent an infection. Symptoms of an infection also include nausea, vomiting, fever or chills,” Dr. Smith says.